The BBC, in partnership with Oxford University, is inviting the public to join the world’s biggest online climate prediction project. The Climate Change project asks members of the public to download a grid computing client (similar to the one used for SETI@Home) to predict future climate change. Your computer downloads and unpacks the experiment itself. The experiment will be running within about five minutes of the download finishing. Your computer will start calculating variables such as temperature, cloud cover and snow fall. Your individual climate model is checked by running it from 1920 to 2000. If your model is very inaccurate (for example, your whole world turns to ice), then your experiment will end. See the FAQs under Ending the experiment. If the climate that your computer works out for 2000 is reasonably like what exists today, phase two begins automatically. 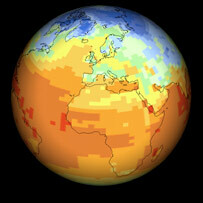 Your set of conditions will run forward to predict future climate for every month up to 2080. Once your experiment has made its prediction for 2080, the final results will be automatically sent back to Oxford University. Check out the official site for more details. You can also check out an interview with Professor Bob Spicer [Windows Media] from the Open University. Next Post Is it worth going to Mix06 out of my own pocket? Climateprediction.net released their last set of results in conjunction with the Summer Science Exhibition at my place of work (The Royal Society) – I confess that on hearing the BBC were getting involved I did have my fingers crossed that something would be done to make the installation of the software more user friendly. It’s amazing what a difference a pretty page with a four-step-guide can make! See this site for more information about Oxford University. Why has it taken the BBC so long to join in, the study’s been around since 2003!! And wshy’s it being touted as something new and radical? Forgot the weblink as proof!